Book Mobile -- scan ISBN from a book and have it added to your google book list. Sometimes it can't add to the list on google. Goggles -- Take a picture of something and google will try to identify it, works best with books, logos, etc. By Google. Google Sky Map -- Very cool reality enhancement. Go out at night and hold the droid up to the sky to see names and info about stars, planets, etc. By Google. Maps (Google) -- Excellent interface. By Google. Network Discovery -- Sort of a nmap port to the android that lets you find out what else is on your network. Integrates with ConnectBot to ssh to servers. Oblique Strategies -- a Classic. Places Directory (Google) -- Show lists of what is nearby you. By Google. The Weather Channel -- nice weather app with widget interface too. androidVNC -- VNC to linux boxes. Servicable, but tricky connecting to a 2 monitor system. Banshee Remote -- requires downloading and running a little python server on the Linux box running Banshee. Could be handy, but may not fit how I listen to music. iSilo -- I use this on my palm pilot, may be useful. 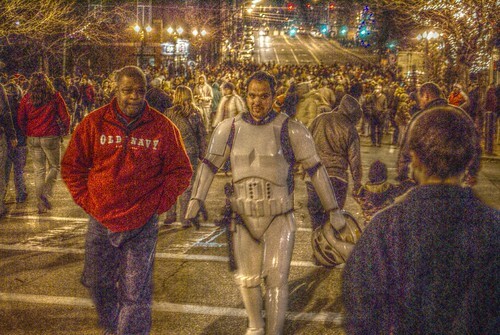 Stormtrooper off duty at Nashua Winter Stroll, originally uploaded by marcn. Woman seated in a chair, with a man, originally uploaded by marcn. 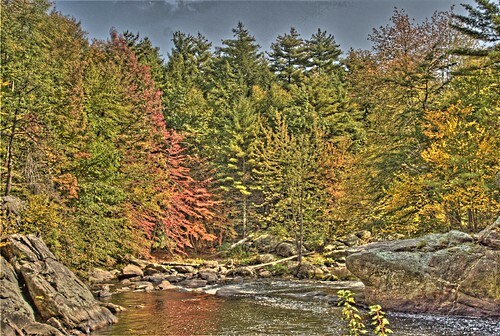 Wildcat Falls in Autumn (HDR), originally uploaded by marcn. Across the street at Wildcat Falls. 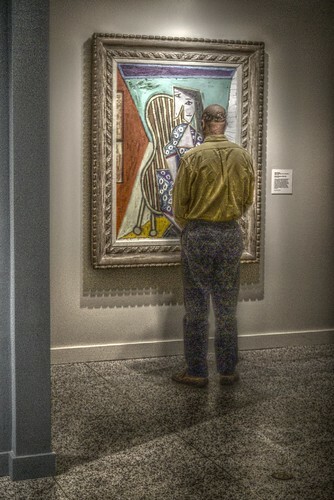 This photo was created from three RAW files using qtpfsgui. Spencer, freshmen class of 2013, originally uploaded by marcn. I'm finally at the point where the little SheevaPlug can replace the aging Compaq DeskPro EN that has been our main home server. Marc Nom Nom Nom, originally uploaded by marcn. 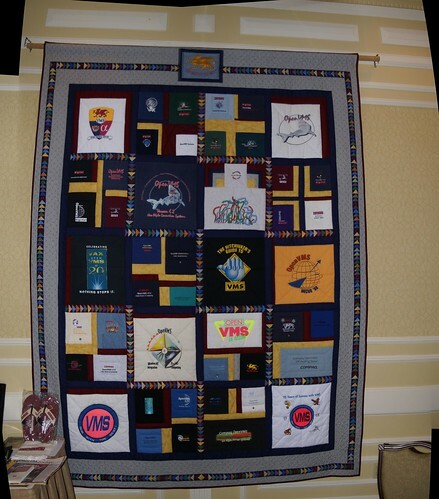 VMS Quilt, originally uploaded by marcn. Last night's VMS Reunion in Nashua was great fun. My very first VMS manager that I had right out of college was there and first person I ever saw carry a cell phone (circa 1988). Thanks to Susan Skonetski for setting it all up! Show-n-Tell day -- brining LordShiva to the MA offices. Need to get 53.6MB/53.6MB of archives. After this operation, 166MB of additional disk space will be used. 0 upgraded, 12 newly installed, 0 to remove and 0 not upgraded. Need to get 5104kB of archives. After this operation, 15.4MB of additional disk space will be used. 0 upgraded, 39 newly installed, 0 to remove and 0 not upgraded. Need to get 11.4MB of archives. After this operation, 24.6MB of additional disk space will be used. Need to get 2947kB of archives. After this operation, 14.6MB of additional disk space will be used. Seems like a bunch of extra stuff... update-motd? Installing NFS to hack around. Eventually storage on lordshiva will be via usb disks. Need to get 503kB of archives. After this operation, 1548kB of additional disk space will be used. Running the following commands will make some recommendations on additional things munin can monitor. Just cut-n-paste the ones you want to enable into a root shell. Remember to restart the daemon too. The pre-installed Ubuntu doesn't include any kernel modules, but thought I'd try using the SheevaPlug as a mini-print/scan server for my hp PSC 1510 All-in-One printer/scanner. 0 upgraded, 59 newly installed, 0 to remove and 0 not upgraded. Need to get 38.4MB of archives. After this operation, 127MB of additional disk space will be used. When I tried to killall lanmap, ssh sessions hung. I could get in via console still. The network seemed to be a bit wonky, so rebooted. This is after the reboot and seems to be when hal is starting up on install. Install is slowing continuing. Hmm, now it appears that the pre-install Ubuntu/Jaunty doesn't include any kernel loadablel modules for things like USB printers. Time to install stock Debian on this beastie. Reading data from 0x100000 -- 0% complete. Reading data from 0x10a000 -- 1% complete. Reading data from 0x114000 -- 2% complete. Reading data from 0x11e800 -- 3% complete. Reading data from 0x128800 -- 4% complete. Reading data from 0x133000 -- 5% complete. Reading data from 0x13d000 -- 6% complete. Reading data from 0x147800 -- 7% complete. Reading data from 0x151800 -- 8% complete. Reading data from 0x15c000 -- 9% complete. Reading data from 0x166000 -- 10% complete. Reading data from 0x170800 -- 11% complete. Reading data from 0x17a800 -- 12% complete. Reading data from 0x185000 -- 13% complete. Reading data from 0x18f000 -- 14% complete. Reading data from 0x199800 -- 15% complete. Reading data from 0x1a3800 -- 16% complete. Reading data from 0x1ae000 -- 17% complete. Reading data from 0x1b8000 -- 18% complete. Reading data from 0x1c2800 -- 19% complete. Reading data from 0x1cc800 -- 20% complete. Reading data from 0x1d7000 -- 21% complete. Reading data from 0x1e1000 -- 22% complete. Reading data from 0x1eb800 -- 23% complete. Reading data from 0x1f5800 -- 24% complete. Reading data from 0x1ff800 -- 25% complete. Reading data from 0x20a000 -- 26% complete. Reading data from 0x214000 -- 27% complete. Reading data from 0x21e800 -- 28% complete. Reading data from 0x228800 -- 29% complete. Reading data from 0x233000 -- 30% complete. Reading data from 0x23d000 -- 31% complete. Reading data from 0x247800 -- 32% complete. Reading data from 0x251800 -- 33% complete. Reading data from 0x25c000 -- 34% complete. Reading data from 0x266000 -- 35% complete. Reading data from 0x270800 -- 36% complete. Reading data from 0x27a800 -- 37% complete. Reading data from 0x285000 -- 38% complete. Reading data from 0x28f000 -- 39% complete. Reading data from 0x299800 -- 40% complete. Reading data from 0x2a3800 -- 41% complete. Reading data from 0x2ae000 -- 42% complete. Reading data from 0x2b8000 -- 43% complete. 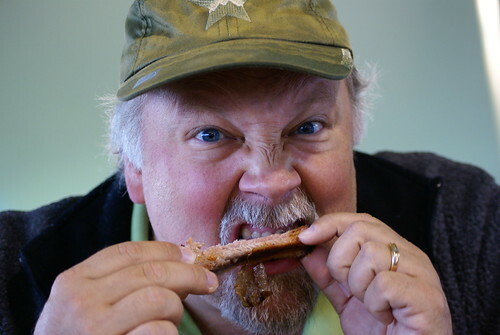 Reading data from 0x2c2800 -- 44% complete. Reading data from 0x2cc800 -- 45% complete. Reading data from 0x2d7000 -- 46% complete. Reading data from 0x2e1000 -- 47% complete. Reading data from 0x2eb800 -- 48% complete. Reading data from 0x2f5800 -- 49% complete. Reading data from 0x2ff800 -- 50% complete. Reading data from 0x30a000 -- 51% complete. Reading data from 0x314000 -- 52% complete. Reading data from 0x31e800 -- 53% complete. Reading data from 0x328800 -- 54% complete. Reading data from 0x333000 -- 55% complete. Reading data from 0x33d000 -- 56% complete. Reading data from 0x347800 -- 57% complete. Reading data from 0x351800 -- 58% complete. Reading data from 0x35c000 -- 59% complete. Reading data from 0x366000 -- 60% complete. Reading data from 0x370800 -- 61% complete. Reading data from 0x37a800 -- 62% complete. Reading data from 0x385000 -- 63% complete. Reading data from 0x38f000 -- 64% complete. Reading data from 0x399800 -- 65% complete. Reading data from 0x3a3800 -- 66% complete. Reading data from 0x3ae000 -- 67% complete. Reading data from 0x3b8000 -- 68% complete. Reading data from 0x3c2800 -- 69% complete. Reading data from 0x3cc800 -- 70% complete. Reading data from 0x3d7000 -- 71% complete. Reading data from 0x3e1000 -- 72% complete. Reading data from 0x3eb800 -- 73% complete. Reading data from 0x3f5800 -- 74% complete. Reading data from 0x3ff800 -- 75% complete. Reading data from 0x40a000 -- 76% complete. Reading data from 0x414000 -- 77% complete. Reading data from 0x41e800 -- 78% complete. Reading data from 0x428800 -- 79% complete. Reading data from 0x433000 -- 80% complete. Reading data from 0x43d000 -- 81% complete. Reading data from 0x447800 -- 82% complete. Reading data from 0x451800 -- 83% complete. Reading data from 0x45c000 -- 84% complete. Reading data from 0x466000 -- 85% complete. Reading data from 0x470800 -- 86% complete. Reading data from 0x47a800 -- 87% complete. Reading data from 0x485000 -- 88% complete. Reading data from 0x48f000 -- 89% complete. Reading data from 0x499800 -- 90% complete. Reading data from 0x4a3800 -- 91% complete. Reading data from 0x4ae000 -- 92% complete. Reading data from 0x4b8000 -- 93% complete. Reading data from 0x4c2800 -- 94% complete. Reading data from 0x4cc800 -- 95% complete. Reading data from 0x4d7000 -- 96% complete. Reading data from 0x4e1000 -- 97% complete. Reading data from 0x4eb800 -- 98% complete. Reading data from 0x4f5800 -- 99% complete. Reading data from 0x4ff800 -- 100% complete. Uncompressing Linux.................................................................................................................................... done, booting the kernel. PEX0 interface detected no Link. Time: kw_clocksource clocksource has been installed. Warning: TS unit is powered off. NTFS driver 2.1.28 [Flags: R/O]. Copyright (c) 1999-2006 Intel Corporation. dm_crypt using the OCF package. Advanced Linux Sound Architecture Driver Version 1.0.14 (Thu May 31 09:03:25 2007 UTC). mvCLAudioCodecRegGet: Error while reading register! mvCLAudioCodecInit: Error - Invalid Cirrus Logic chip/rev ID! VFS: Mounted root (jffs2 filesystem). The Hardware Clock does not contain a valid time, so we cannot set the System Time from it. Unable to set system clock. My SheevaPlug arrived with Ubuntu/Jaunty pre-installed on it. 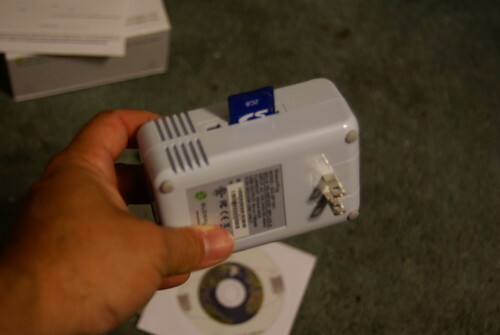 Holding a SheevaPlug with MMC card inserted, originally uploaded by marcn. After placing my order on April 1st, my SheevaPlug arrived today. Toward the end of April and it still hadn't gotten a FedEx tracking number, I sent email to Global Scale Technologies. Within a few hours had a reply from The VP of Sales and Marketing. When I provided my order number, he verified it was received and made sure it was shipped out early May. Kudos on the service! My SheevaPlug finally arrived. Ordered the morning (EDT) of April 1st and arrived May 12th. Install and run gtkerm Set the default port to /dev/ttyUSB1 and 11850 8N1 for the connection. I saved it as the default configuration to make like easier later. Add to local apt caching by adding /etc/apt/apt.conf. I already have apt-cacher setup on the 192.168.1.234 host. 1 upgraded, 1 newly installed, 0 to remove and 102 not upgraded. Need to get 75.4kB of archives. After this operation, 69.6kB of additional disk space will be used. This is what it has, but there is no DNS server running on the SheevaPlug. Fix it manually to point to my local ISP. 96 upgraded, 0 newly installed, 0 to remove and 6 not upgraded. Need to get 40.3MB of archives. After this operation, 3351kB of additional disk space will be used. The new root password doesn't work! Use serial line and catch (press any key) on boot. 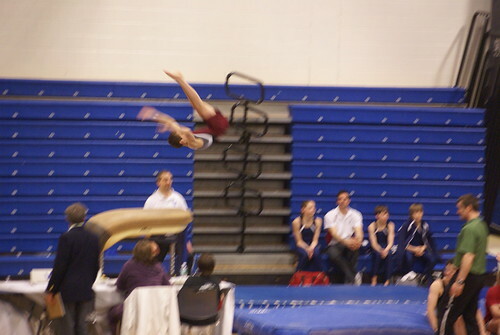 Trevor's 15.3 Vault, originally uploaded by marcn. 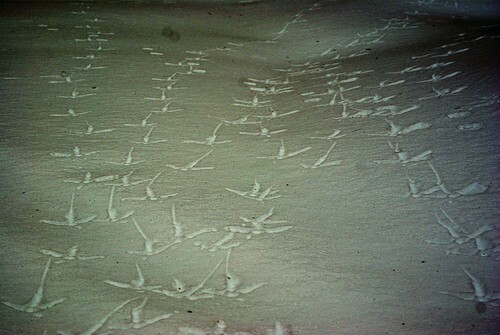 Turkey Tracks, originally uploaded by marcn. Lots of snow this season..., originally uploaded by marcn. 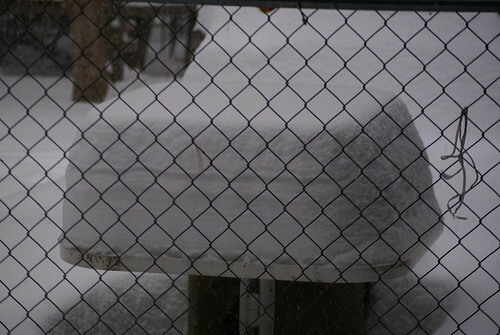 Today is yet another snow day for the kids.